There are some things that I seem to remember being interminably boring from childhood – Jane Austen, Oscar Petersen, Fred & Ginger movies my Grandma loved – that when I have returned to them as a grown up, I wonder why I ever cast them aside. Yesterday at a tea tasting with Henrietta Lovell, she served some of her more delicate infusions with crust-less cucumber sandwiches. A dull little snack you may think but no! I exhort you to try this as soon as you can! 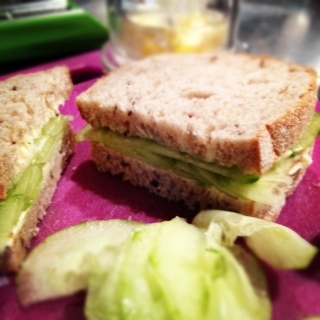 Henrietta’s were made with excellent white bread, luscious, generously-spread butter and peeled cucumber, sliced wafer thin, crisp yet gently weeping having been sprinkled with salt…the flavours were perfect. The floral notes of the cucumber transferred to the tongue by the catalyst of butter and the warm, wheatiness of the bread all acted as a the perfect companion to a wide range of teas, too many for my little brain to remember. Anyway, another reason for lack of appetite is that I cooked at lunchtime for a friend but now the football is on and I am imagining the man who needs to fall in love lounging on some other woman’s sofa watching so I might as well eat. Although I’m Scots by birth, I always back England in an international. 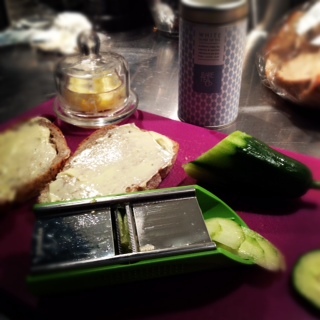 And what is more patriotic than a cup of tea and a cucumber sandwich? Sadly I didn’t have any of Richard Bertinet’s bread – According to Henrietta he makes THE perfect bread for a cucumber sandwich – so it was the vestiges of the spelt and rye that came to the rescue. But I did get to use my new gadget picked up in Williams Sonoma in NYC last week. A tiny little mandolin. It’s perfect for veggies. I don’t know about you, but I’ve bought mandolins for £100 – huge, professional numbers – to £10 Japanese ones from men on market stalls who julienne entire sacks of veg only for me to get it home and clog it within seconds. But this little one is just perfect. $30 and made by Swissmar. I love it…almost as much as The Rare Tea Company’s Silver Tip Tea. I’m drinking a third infusion which I believe is the best, the first two having been drunk by me and my mate earlier. Until recently I never realised you could take multiple infusions from tea that actually improve and change as you make them – again thank you Rare Tea Lady. All in all a very economical supper in front of the telly box. It’s my sofa and I’ll sprawl if I want to.